New data provides the strongest evidence to date that the world's biggest mud volcano, which killed 13 people in 2006 and displaced thirty thousand people in East Java, Indonesia, was not caused by an earthquake, according to an international scientific team that includes researchers from Durham University and the University of California, Berkeley. Drilling firm Lapindo Brantas has denied that a nearby gas exploration well was the trigger for the volcano, instead blaming an earthquake that occurred 280 kilometers (174 miles) away. They backed up their claims in an article accepted this week for publication in the journal Marine and Petroleum Geology, by lead author Nurrochmat Sawolo, senior drilling adviser for Lapindo Brantas, and colleagues. In response, a group of scientists from the United Kingdom, United States, Australia and Indonesia led by Richard Davies, director of the Durham Energy Institute, have written a discussion paper in which they refute the main arguments made by Nurrochmat Sawolo and document new data that provides the strongest evidence to date of a link between the well and the volcano. That paper has been accepted for publication in the same journal. The Lusi volcano, which first erupted on May 29, 2006, in the Porong sub-district of Sidoarjo, close to Indonesia's second city of Surabaya, East Java, now covers seven square kilometers – nearly three square miles and is 20 meters (65 feet) thick. The mud flow has razed four villages and 25 factories. Thirteen people have died as a result of a rupture in a natural gas pipeline underneath one of the holding dams. The Lusi crater has been oozing enough mud to fill 50 Olympic size swimming pools every day. 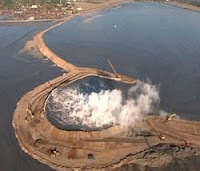 All efforts to stem the mud flow have failed, including the construction of dams, levees, drainage channels, and even plugging the crater with concrete balls. Lusi may continue to erupt for decades, scientists believe. "An earthquake trigger can be ruled out because the earthquake was too small given its distance, and the stresses produced by the earthquake were minute smaller than those created by tides and weather," said co-author Michael Manga, professor of earth and planetary science at the University of California, Berkeley. "The observation that pumping mud into the hole caused a reduction in eruption rate indicates a direct link between the wellbore and the eruption," he added. "The decision was made to pull the drill bit out of the hole without verifying that a stable mud column was in place and it was done while severe circulating mud losses were in progress. This procedure caused the kick."